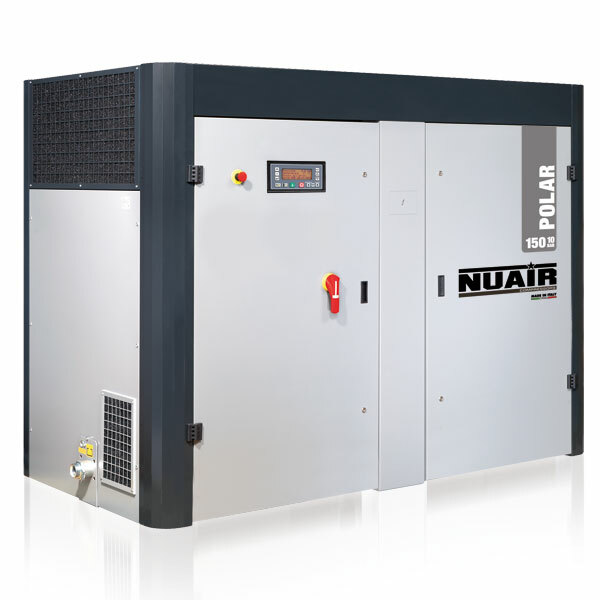 NU AIR is a worldwide leader in the production of air compressors suitable to all industrial and professional sectors. NU AIR offers a wide range of products designed to suit all applications and consolidated by a broad choice of accessories for compressed air distribution and treatment. NU AIR SCREW COMPRESSORS are designed to offer reliable and efficient operation, optimisation of energy consumption, reduced operating and energy costs and simple installation and use. The entire production procedure is carried out at the Italian manufacturing plants of the NU AIR Group. All of the compressor main components: air-end, intake regulator and minimum pressure valve are manufactured based on project specifications owned by NU AIR. Assembling and testing performed on automated lines, robotic systems of the latest generation, and computer tools for design and control are the main investments that the company has implemented to realise products that meet the market’s quality standards. NU AIR rotary screw compressors are the answer to the needs of small and medium-sized enterprises, where compressed air is one of the main sources of energy. NU AIR SCREW COMPRESSORS are designed to offer reliable and efficient operation, optimisation of energy consumption, reduced operating and energy costs and simple installation and use. Rotary screw compressors with belt-driven transmission and power from 7.5 and 22 kW. The STAR and VEGA compressors are extremely silent an represent an "all-in-one" solution: a true compressed air station in a single unit, without further cost of installation, including air-end, air receiver, electronic controller, integrated dryer and filters. VEGA: floor mounted version, also available with integrated dryer and filters, fixed or variable speed. Lubricated direct driven rotary screw compressors, fixed or variable speed: the optimal response to the modern industry compressed air demands. The machine is fitted with electronic controller, aftercooler, condensate separator (external for models 280 and 340) with time based drain. POLAR in the standard configuration, is air cooled and it is designed for continuous operation 24/7. Optional versions have available water cooling and heat recovery “oil to water” heat exchanger. POLAR series compressors are equipped with high efficiency electric motors with protection degree IP55 and insulation class F.
Power transmission to the airend is carried out by means of a flexible coupling and a helical gearbox. This configuration allows the perfect alignment of the shafts, granting optimal power transmission. POLAR standard configuration includes a prefilter panel which separates dust and powder in order to keep the interior of the machine clean and easy to maintain. Wide opening doors with safety locks grant ease of access for maintenance and service. Coolers are easily accessibile. Separated fans with Class F IP54 motors provide maximum cooling air flow: the number of fans depends on the size of the compressor. Due to the type of fans, their position and the excellent soundproofing of the whole machine, POLAR compressors are extremely silent.